Maslow’s humanistic theory of personality states that people achieve their full potential by moving from basic needs to self-actualization. As a leader of humanistic psychology, Abraham Maslow approached the study of personality by focusing on subjective experiences, free will, and the innate drive toward self-actualization . Maslow expanded the field of humanistic psychology to include an explanation of how human needs change throughout an individual’s lifespan, and how these needs influence the development of personality. Maslow’s hierarchy of needs ranks human needs from the most basic physical needs to the most advanced needs of self-actualization. A person must acquire and master each level of need before proceeding to the next need. Maslow studied the personalities of self-actualizers and found they had many things in common; he believed self-actualizers indicate a coherent personality syndrome and represent optimal psychological health and functioning. Maslow’s ideas have been criticized for their lack of scientific rigor, as well as their Western cultural bias. humanistic psychology: A psychological perspective which rose to prominence in the mid-20th century in response to psychoanalytic theory and behaviorism; this approach emphasizes an individual’s inherent drive towards self-actualization and creativity. self-actualization: According to humanistic theory, the realizing of one’s full potential; can include creative expression, quest for spiritual enlightenment, pursuit of knowledge, or the desire to give to society. Often called the “third force” in psychology, humanism was a reaction to both the pessimistic determinism of psychoanalysis, with its emphasis on psychological disturbance, and to the behaviorists’ view of humans passively reacting to the environment. Two of the leading humanistic theorists who made advancements in the field of personality psychology were Abraham Maslow and Carl Rogers. In his research, Maslow studied the personalities of people who he considered to be healthy, creative, and productive, including Albert Einstein, Eleanor Roosevelt, Thomas Jefferson, Abraham Lincoln, and others. He found that such people share similar characteristics, such as being open, creative, loving, spontaneous, compassionate, concerned for others, and accepting of themselves. Maslow is perhaps most well-known for his hierarchy of needs theory, in which he proposes that human beings have certain needs in common and that these needs must be met in a certain order. These needs range from the most basic physiological needs for survival to higher-level self-actualization and transcendence needs. Maslow’s hierarchy is most often presented visually as a pyramid, with the largest, most fundamental physiological needs at the bottom and the smallest, most advanced self-actualization needs at the top. Each layer of the pyramid must be fulfilled before moving up the pyramid to higher needs, and this process is continued throughout the lifespan. Maslow’s hierarchy of needs: Abraham Maslow developed a human hierarchy of needs that is conceptualized as a pyramid to represent how people move from one level of needs to another. First physiological needs must be met before safety needs, then the need for love and belonging, then esteem, and finally self-actualization. Maslow believed that successful fulfillment of each layer of needs was vital in the development of personality. The highest need for self-actualization represents the achievement of our fullest potential, and those individuals who finally achieved self-actualization were said to represent optimal psychological health and functioning. Maslow stretched the field of psychological study to include fully-functional individuals instead of only those with psychoses, and he shed a more positive light on personality psychology. Maslow viewed self-actualizers as the supreme achievers in the human race. He studied stand-out individuals in order to better understand what characteristics they possessed that allowed them to achieve self-actualization. In his research, he found that many of these people shared certain personality traits. Most self-actualizers had a great sense of awareness, maintaining a near-constant enjoyment and awe of life. They often described peak experiences during which they felt such an intense degree of satisfaction that they seemed to transcend themselves. They actively engaged in activities that would bring about this feeling of unity and meaningfulness. Despite this fact, most of these individuals seemed deeply rooted in reality and were active problem-seekers and solvers. They developed a level of acceptance for what could not be changed and a level of spontaneity and resilience to tackle what could be changed. Most of these people had healthy relationships with a small group with which they interacted frequently. According to Maslow, self-actualized people indicate a coherent personality syndrome and represent optimal psychological health and functioning. Maslow’s ideas have been criticized for their lack of scientific rigor. As with all early psychological studies, questions have been raised about the lack of empirical evidence used in his research. Because of the subjective nature of the study, the holistic approach allows for a great deal of variation but does not identify enough constant variables in order to be researched with true accuracy. Psychologists also worry that such an extreme focus on the subjective experience of the individual does little to explain or appreciate the impact of society on personality development. Furthermore, the hierarchy of needs has been accused of cultural bias—mainly reflecting Western values and ideologies. Critics argue that this concept is considered relative to each culture and society and cannot be universally applied. Carl Rogers’ humanistic personality theory emphasizes the importance of the self-actualizing tendency in forming a self-concept. Carl Rogers was an influential humanistic psychologist who developed a personality theory that emphasized the importance of the self-actualizing tendency in shaping human personalities. Rogers believed that humans are constantly reacting to stimuli with their subjective reality ( phenomenal field ), which changes continuously. Over time, a person develops a self- concept based on the feedback from this field of reality. In the development of self-concept, positive regard is key. Unconditional positive regard is an environment that is free of preconceived notions of value. Conditional positive regard is full of conditions of worth that must be achieved to be considered successful. Human beings develop an ideal self and a real self based on the conditional status of positive regard. How closely one’s real self matches up with their ideal self is called congruity. Rogers believed that fully functioning people could achieve “the good life,” in which they constantly aim to fulfill their potential and allow their personalities to emanate from their experiences. Like Maslow’s theories, Rogers’ were criticized for their lack of empirical evidence in research. holistic: Relating to the whole instead of a separation into parts. congruity: An instance or point of agreement or correspondence between the ideal self and the real self in Rogers’ humanistic personality theory. phenomenal field: Our subjective reality, all that we are aware of, including objects and people as well as our behaviors, thoughts, images, and ideas. Carl Rogers: Carl Rogers was a prominent humanistic psychologist who is known for his theory of personality that emphasizes change, growth, and the potential for human good. 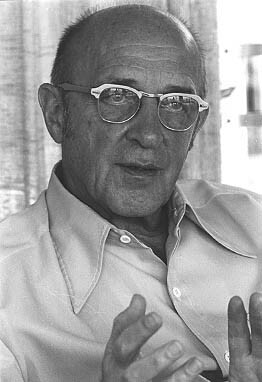 Carl Rogers was a prominent psychologist and one of the founding members of the humanist movement. Along with Abraham Maslow, he focused on the growth potential of healthy individuals and greatly contributed to our understanding of the self and personality. Both Rogers’ and Maslow’s theories focus on individual choices and do not hold that biology is deterministic. They emphasized free will and self-determination, with each individual desiring to become the best person they can become. Humanistic psychology emphasized the active role of the individual in shaping their internal and external worlds. Rogers advanced the field by stressing that the human person is an active, creative, experiencing being who lives in the present and subjectively responds to current perceptions, relationships, and encounters. He coined the term actualizing tendency, which refers to a person’s basic instinct to succeed at his or her highest possible capacity. Through person-centered counseling and scientific therapy research, Rogers formed his theory of personality development, which highlighted free will and the great reservoir of human potential for goodness. Rogers based his theories of personality development on humanistic psychology and theories of subjective experience. He believed that everyone exists in a constantly changing world of experiences that they are at the center of. A person reacts to changes in their phenomenal field, which includes external objects and people as well as internal thoughts and emotions. The phenomenal field: The phenomenal field refers to a person’s subjective reality, which includes external objects and people as well as internal thoughts and emotions. The person’s motivations and environments both act on their phenomenal field. Rogers believed that all behavior is motivated by self-actualizing tendencies, which drive a person to achieve at their highest level. As a result of their interactions with the environment and others, an individual forms a structure of the self or self-concept—an organized, fluid, conceptual pattern of concepts and values related to the self. If a person has a positive self-concept, they tend to feel good about who they are and often see the world as a safe and positive place. If they have a negative self-concept, they may feel unhappy with who they are. Rogers further divided the self into two categories: the ideal self and the real self. The ideal self is the person that you would like to be; the real self is the person you actually are. Rogers focused on the idea that we need to achieve consistency between these two selves. We experience congruence when our thoughts about our real self and ideal self are very similar—in other words, when our self-concept is accurate. High congruence leads to a greater sense of self-worth and a healthy, productive life. Conversely, when there is a great discrepancy between our ideal and actual selves, we experience a state Rogers called incongruence, which can lead to maladjustment. In the development of the self-concept, Rogers elevated the importance of unconditional positive regard, or unconditional love. People raised in an environment of unconditional positive regard, in which no preconceived conditions of worth are present, have the opportunity to fully actualize. When people are raised in an environment of conditional positive regard, in which worth and love are only given under certain conditions, they must match or achieve those conditions in order to receive the love or positive regard they yearn for. Their ideal self is thereby determined by others based on these conditions, and they are forced to develop outside of their own true actualizing tendency; this contributes to incongruence and a greater gap between the real self and the ideal self. A growing openness to experience–they move away from defensiveness. An increasingly existential lifestyle–living each moment fully, rather than distorting the moment to fit personality or self-concept. Increasing organismic trust–they trust their own judgment and their ability to choose behavior that is appropriate for each moment. Freedom of choice–they are not restricted by incongruence and are able to make a wide range of choices more fluently. They believe that they play a role in determining their own behavior and so feel responsible for their own behavior. Higher levels of creativity–they will be more creative in the way they adapt to their own circumstances without feeling a need to conform. Reliability and constructiveness–they can be trusted to act constructively. Even aggressive needs will be matched and balanced by intrinsic goodness in congruent individuals. A rich full life–they will experience joy and pain, love and heartbreak, fear and courage more intensely. Like Maslow’s theories, Rogers’ were criticized for their lack of empirical evidence used in research. The holistic approach of humanism allows for a great deal of variation but does not identify enough constant variables to be researched with true accuracy. Psychologists also worry that such an extreme focus on the subjective experience of the individual does little to explain or appreciate the impact of society on personality development.